Cut, Cap, and Destroy: On TV yesterday, I stressed the point that a rule that locks in federal expenditures at 18% of GDP takes away a key function of the gov’t: countercyclical policy where gov’t spending offsets the contraction in private sector demand. But, you say, states must balance their budgets—why can’t the feds? Well, it’s precisely because states must balance their budgets that you need a higher level of gov’t that is not bound by this restriction. Think of a recession as being in a boat that’s taking on a water where only one person—but a person with a very big bucket—can bail, while 50 other people just sit there without any buckets at all, or worse, dump more water into the boat (by enacting procyclical tax increases or service cuts). A Balanced Budget Amendment takes away the big guy’s bucket too. Then the boat sinks. A Pox on One of Their Houses: As Jon Cohn points out toward the end of this blog, it’s irresistible among the punditry at times like this to inveigh against “Washington” and stress a pox on both their houses, painting the partisanship with a broad stroke under the assumption that nobody’s flexible. Except that’s wholly wrong. The Obama administration has been extremely flexible—too much so, in many people’s thinking. Their opening bid had $2 of spending cuts to $1 of new revenue, and they’ve signaled openness to cuts in Social Security (through shifting to the chained CPI), Medicare, Medicaid, and discretionary spending. The President has made good on his word to leave the Democratic comfort zone, often to the great discomfort of Democrats. You know the rest, and so should everyone else. The minute Cantor cantered, the broad “Washington” critique was invalidated. Govern, Dudes! This NYT editorial has it right: too many legislators are working awfully hard to figure out ways to avoid legislating. The NYT focuses on the tax pledge, and that’s a big part of the problem. But you see the same dynamic in the Balanced Budget Amendment and the McConnell debt ceiling plan. The former is for those who don’t have the nerve to legislate cuts so they impose a spending cap that will force those cuts. The second is a convoluted ploy to get the debt ceiling raised without your fingerprints on it—in fact, you get to vote against it. Note: Wouldn’t want to make too much out of opinion polls on this right now, what with the thing lurching around from day-to-day. But Obama’s “strategy” of being the grown up amidst some egregiously irresponsible behavior may be resonating with the public (“strategy” in quotes, because I don’t really think it’s a strategy…that’s who he is). Note particularly the president’s large advantage in the share who have a great deal of confidence in him around these negotiations. Share the post "Roundup of Deeply Annoying Stuff"
4 comments in reply to "Roundup of Deeply Annoying Stuff"
It is quite frustrating, especially #2. I sometimes want to throw a shoe at the next pundit who says that neither side wants to compromise. Really! That’s supposed to be objective. There is the next FMI. That will help. 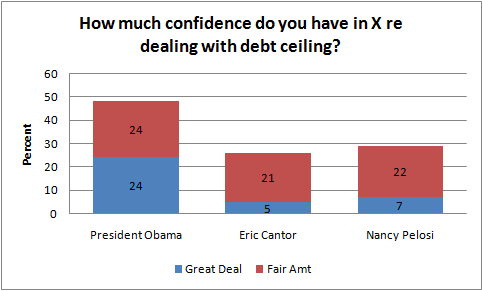 One more point: I think the poll is reflective of Obama bringing this case to the American people. Why he has not done this more during his presidency is perplexing. I have been saying that he should have been doing this forever. Instead of constantly compromising, he should be leveraging his support, the people who elected him and then some. People will support him, but he has to solicit it…. So annoying. Because the media hasn’t repeated it? He can’t make them repeat what he says. The ‘states have to balance their budget’ argument really annoys me. Especially when you look closely at how states often get their budgets ‘balanced’ – see this Matt Yglesias blog entry for example: http://thinkprogress.org/yglesias/2011/07/19/273373/state-pensions-or-how-conservatives-learned-to-stop-worrying-and-love-borrowing/ – Yeah, Virginia ‘balanced’ its budget by not making payments to its pension plan. Thank you, Mr. Bernstein, for this blog – great stuff!